← Testing, testing, testing ! When I was young and naive, and a novice journalist, I wrote an article in a woman’s magazine which began:’ I got most of my education under the bed-clothes’, and went on to discuss children’s reading. Some wag must have been reading his wife’s copy, and the clipping appeared on the office notice-board amid crude male guffaws. Thank you chaps, I got the message! Not a quick learner, but I got there in the end! Reading under the bed – clothes was the refuge of a child who was sent to bed at seven o clock every night, and allowed to read for fifteen minutes. Fifteen minutes! When I got older, and had more homework bed was set back to seven thirty, but the fifteen minute reading restriction still applied. Only a non-reader could have stipulated this ridiculous time limit, so under the bed clothes it was. When I had no torch I knelt for hours, freezing in my night clothes squinting to read by the crack of light under the door from the hall light. Occasionally I tried the loo or the bathroom, but this was risky, as books aren’t easily hidden by a skinny child under a thin nightie. When I was fourteen I picked up Jane Eyre in the library. It exploded into my consciousness. I felt dazed and obsessed by the strange, compelling self-centred story. I could think of nothing else. I read it over and over again. I read it under the desk at school, in the bus and on the train, and of course, in bed. Once the parents had gone to bed, I switched my light on with impunity, and read until I had finished Jane Eyre, and then started ‘Villette’, by which time it was heading for five o clock in the morning. Since I had to get up at six to cook my breakfast and catch the school bus at seven am, it seemed safer to stay awake, and soldier on. And having done it once, and finding it was possible to keep going without sleep, I quite often sacrificed my sleep for a good book after that. Boarding school was tricky, but once again, there was always the bathroom. When I left home and became my own master, reading in bed became one of my favourite pastimes. Mostly literature and poetry in those palmy days. And usually then I had a bowl of apples to munch meditatively as the hours went by, or better still, a bar of chocolate. Sometimes decadence overcame me and I had a glass of lemonade. Marriage and motherhood dished all that of course, and reading in bed became a distant remembered pleasure. But in the last few years since my husband’s snores have become so loud they wake me even when I’m sleeping in another room, we’ve taken a page out of the Royal Family’s domestic habits, and now sleep in separate rooms. This means I can read without disturbing him, and I’ve raised this noble pastime to a fine art. And then there’s the third category – those which are on the go, sometimes a new novel – Barbara Kingsilver at the moment, but not many of those – a biography, a history, a diary. And for real relaxation I sink into nature journals, often a classic like Flora Thompson’s: ‘Lark Rise at Candleford’ … Annie Dillard, Henry Beston or Ronald Lockley… mostly accounts of gentle, unpolluted country life. But reading in bed isn’t just books. The bed matters too… preferably by the window… in summer with cool white linen- cotton blend sheets that have a silky feel, in winter comforting coloured flannelette to match the duvet. Pillows – plenty of them, to lean back on and others to support the elbows. Electric blanket a must in cold weather… I use it a bit like the hot tap in the bath… whenever it seems a bit chill, I switch it on until the bed is like toast again, and then prudently switch off again until the next time. In summer, there’s the bliss of going to bed in day-light, knowing you have hours in front of you before dusk creeps up, before finally switching on the light. In winter, lamps on, curtains pulled, wood fire still burning in the sitting room to keep the house warm for when I emerge to make a cup of tea. And the bed, pyjamas warmed under the bed clothes on the electric blanket, cosy sheets and pillow slips, red mohair rug edged with wine-red satin, and a stash of peppermints to slowly chew as I turn the pages. No sounds, just the murmur of the soft sea, a distant owl, and occasionally a scuffle on the roof as a possum scrambles across. The sound of rain on the roof is good too. Running out of inspiration, I took an organic free range chicken out of the deep freeze, and after de-frosting it slowly in the fridge for two days, stuffed it with a pierced lemon and put it on to steam. After an hour and three quarters, I placed around it in the steamer, new potatoes, carrots, leeks, small onions and parsnips. When the chicken is ready so are the vegetables. I usually make a parsley sauce to serve with this, but didn’t feel like a heavy floury sauce, so instead chopped garlic cloves very finely, sauted them in butter, and added a vegetarian oxo cube and cream. I boiled and stirred until it was thickened, and added lots of chopped parsley. It turned out rather well. The bonus of steaming is a wonderful chicken stock, as the chicken juices drip into the boiling water beneath the steamer. More on that next time! Those who do not have power over the story that dominates their lives, power to re-tell it, to re-think it, deconstruct it, joke about it and change it as times change, truly are powerless, because they cannot think new thoughts. Sir Salman Rushdie – famous Indian writer, educated in England, lives in America, and winner of many prizes and honours. Thank you Kathie., lovely to hear from you… I must say the pad sounds wonderful… I haven’t heard of it, and wonder if we can get it here. Shall do some investigations! I want to rush out and get you a flashlight (a torch?). 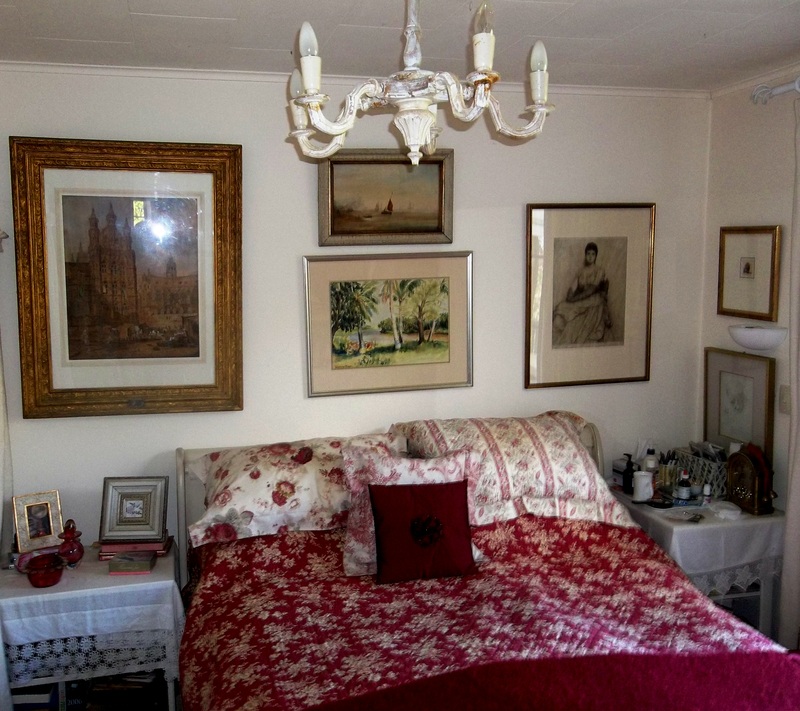 Nana loved Georgette Heyer and thus so did I. Lovely read read – lovely bedroom. Thank you. Lovely to hear from you Liz, glad you enjoyed it… good to know there are other Georgette Heyer fans… I actually did a blog on her in my early days of blogging – Mental Knitting – Thank you for the thought of the flashlight.. you’d think they’d have invented something more technological by now, wouldn’t you!!! Wonderful. Relatable. (I wrote a poem on the same subject!) A well told story. We might share this one on Bardo if it’s okay with you. ??? Thank you Jamie, glad you enjoyed it ! I’d love to see it on Bardo,- an honour ! Great to hear from you Helen, loved your stories about the light and your sister. Reading without guilt at chores that have to be done, is one of the compensations for not wanting to climb mountains any more, at our age, isn’t it! You put me to shame with your expertise with Kindle and Kobo… good to be in touch this way !!! Valerie, you make reading in bed sound so very seductive! I too read in bed as a child, using a little torch. Reading was my constant companion. As a writer, I rejoice every time I hear of someone who enjoys reading real books, but of course I’m just as much a reader as a writer. I think the two go together. Hello Juliet, lovely to hear from you… yes, we readers-/writers should stick together !!! I always remember Maurice Shadbolt buying stacks of books written by other NZ writers, and discussing very seriously about having to read them as part of his job as a writer… I have to admit I only read I want to, not because I should ! This was one of your best. I know the snoring thing! Kingsolver is one of my favorites. Some of the writers you mention are unknown to me. I will check them out if we ever get moved in. I read 18 books in the 2 months we were waiting for our stuff to arrive. I got my computer hooked up yesterday. It’s been 8 months since I’ve done any writing. I worry I’ve forgotten how!!! Great you’ve got your computer back… your home station… I’m sure writing is like riding a bicycle isn’t it… you never forget… you’ll probably be even better after having a break and reading all those books…I envy you having had the time!!!! Wow – what a pleasure it is to read your superbly written narrative: the vivid imagery, rich expressions and exquisite associations give me the sensation to be physically there and to experience the same, yet in a novel dimension. It makes me want to renew this dear old habit of reading in bed. Its effect is like a flashback of my teenager years, capturing the tiniest details of how it felt to step through the doors those classics opened to undiscovered worlds, and how reading them awakened emotions that had been unknown until then. Jane Eyre was indeed one of these books – Emily Brontë’s Wuthering Heights also comes to mind as another major novel in that line. There was something extraordinarily powerful and magical, yet so human and real, to the world of the Brontë sisters. Great to hear from you, and thank you so much for your generous words of appreciation…Interesting how many of us had the same experience reading Jane Eyre, another blogger has commented on the same phenomenon! Glad you enjoyed the food – mental and corporeal !!! A delicious post. My delight for the past 4 years is a feather mattress topper. I ADORE it, summer and winter. And I am so pleased that you like red colours in your sleeping/reading zone. I have them too yet most people seem quite perplexed by my choice. Did you watch the TV series Larkrise to Candleford? I loved it but it is probably nothing like the book. Ah, now I just feel like going to bed with a good book; it’s sheer luxury just as you describe. Thank you -so glad you enjoyed it…. I know what you mean about the feather mattress topper, my darling daughter-in-law gave me one last Christmas… bliss isn’t it! So glad you have a feather mattress topper! I think there is a lovely tone in the TV series so perhaps not too different from the books. Of course, I suppose you don’t need a torch with that new fangled- stuff!!!! Oh yes, that bleary-eyed feeling! I read till two last night, and find I don’t spring back the way you do when you are young ! Like a hangover really!!! I know what you me–I am not as spritely as I used to be–but that will not stop us from reading will it? You are a delight! No it won’t, will it !!! It’s a terrible thing not to be appreciated ! But I’m sure you are – in the blogging world anyway! Sharla, you are such a darling – thank you so much for taking the time both to read and comment when you have so much on your hands at the moment, I really appreciate it, and your lovely words. You are so generous… and such a faithful reader – you were one of the first people to read my blog! I just finished one while Jim is sleeping: The Eyes of Love. Let me know what you think 🙂 I slept on the ‘couch seat’ last night since Jim had his procedure yesterday. One does not stay in the hospital and expect to actually sleep! Oh! YES! YES! Yes! I read in bed. I read at four books a night. I read one until it gets to a dull spot, then on to the other until I am too sleepy to stay awake. Since Terry and I sleep in different rooms I read until I’m too tired to stay up and then get up at five in the morning. Although, I didn’t have boarding school I had my mother’s best friend’s oldest daughter who was a huge bully to me all of my years of youth, and would still be one if I were to arrive in her sphere…books helped me through those times…like you I read in the bathroom, in bed, under the stairs at school, on the bus…I refused to look at that girl as not to give her a chance to do something…I still love books. I sigh when they end and start another or even that one again. I have one I’ve read 17 times. I tried to read it last summer and just couldn’t…I guess I out-grew it finally. Hello LInda – would love to know what book you read seventeen times… sounds like me with the film Gone With the Wind, which I saw eleven times – and couldn’t bear to see again either!!! We obviously share the same habits, going to bed with a pile of books !! I’m a lot older than you, but I find that reading beyond midnight really knocks me up these days, but I still do it !!! I don’t know how you manage with all that hard physical work during the day, and getting up so early… why five o clock.?.. I thought only milking farmers had to do that… or do you need all that extra time in the day??? I read in the bed or the bath tub lol! Or on the sofa, outside, in the dining room….yeah! A book addict is wall…addicted! Yes, addiction even means having a book in one’s handbag, to read in queues and waiting rooms !!! Taking one with me today on a road trip! Can’t be without a book! I don’t read in bed but downstairs in a favorite chair. Sometimes I just have to finish the book and go to sleep in the wee hours of the morning. I am happy though. You sound like me Kate.. this is one reason why I don’t read many novels, I can’t put them down till I’ve finished them – whatever the time!!! Two o’ clock the other day…. You and I have so much in common, our life-long love affair with books being the tie that binds us even from across oceans. Though I often hid under bed covers my favorite place was the closet where I had hidden a battery operated camp light and candles for backup. Today, I have a reading light and mounds of pillows. I always have books by the side of the bed. When I travel I always have several with me and my greatest joy is being able to lay in the middle of the bed with better light! The joys of being transported, books are that single and most marvelous gift. Yes, life without books would be unthinkable, wouldn’t it…and rooms without books seem empty and lifeless….while a journey without a book would be a nightmare !!! Hello LInda, great to hear from you, and so glad you enjoyed the blog. What a wonderful description of your encounter with Jane Eyre, who seems to have knocked a few people back !!! Aside from the pleasures of reading I am discovering another reason to love books: they put you in touch with humans with whom you have something in common. When meeting a total stranger, asking the question, “What are you reading?” starts sharing information about tastes, common interests, and gives many subjects to discuss. You’re so right, a wonderful way of making friends. Your comment reminded of Alan Bennett’s hilarious little book ‘The Uncommon Reader’ an imaginary story about the Queen and how she becomes a reader, which sets her thinking and asking those questions, and upsetting the whole apple cart.!! Instead of asking how far people have come, she asks them what they’re reading, which either means she gets later and later, or people get upset, because they never read!!! It appears to me now that am not crazy as pple suggest, reading through out the night is pleasurable especially when undercovers and munching peanuts.i am a confessed book adict, i find it hard to fall a sleep, if a i have not touched a book at least for 4hrs.seeing that there is another book addict like me somewhere on the face of earth has dispelled ma fears. thanks . Hello! good to hear from you… from reading all the comments you’ll have discovered that you’re in good company, I think ! Ha’ha, Michele. bed and book and tea! What more can a girl ask !!! My bed and my books were my escape when I was a child, escape from a very noisy house with loads going on. I didn’t have a set reading time like you, but my mother was forever telling me I would ruin my eyesight reading in bad light. It was my favourite place in the world. The only difference being I had to have (and still do) a cold, cold bed. No electric blanket for me, I like the sheets cool and crisp and even in winter I refuse to have the window shut or any heating in my bedroom 🙂 And I still love to read in bed and thoroughly enjoy Georgette Heyer. Lovely post Valerie. Tersia, first of all, congratulations on your awards… you certainly deserve whatever comes your way, and it’s good that you have a few things to brighten your life!!! I’m so glad that you are recognised. I once read in bed, but feel on my head…”never again” is all that I said. Please excuse my Seuss impression. Great post. Thanks for stopping by my little old site! Great to hear from you… never apologise for sounding like wonderful DR Seuss – I love him… I interviewed him once – lucky me !!!! That must have been exciting. Does he speak anything like he writes? I enjoyed his books with my kids as they grew up. Thanks for the reply and visit! He was lovely – charming, handsome and good !!!! That’s great, Valerie. You take care and thanks for your replies. So true – thank you for that Rebecca… the gods have been generous to many of us, judging from the commentds !!! Am copying this now to post on Bardo on May 24th. Okay with you: Please send me photograph and bio. Thanks! Thanks! FYI: I love Georgette Heyer and have read absolutely everything she wrote. Among other things, unlike Jane Austen, because she’s contemporary she doesn’t assume complete knowledge of the culture and history on the part of the reader. She is also one of the best mystery writers ever. oh really? I never read detective novels and I should obviously start !!!! Oh, they’re not as popular as the Regency. I don’t know if they’re still published. Noted recently that there’s a biography of her out … you know what I’ll be reading soon! LOL! Forgive me for this but did I ask you for a photograph and bio yet? I have your post ready to go, but will need them to proceed. It’s a great post. Thanks! No rush, but wanted to make sure I did. Hello Jamie, I sent you a photo, and asked if you thought the bio in ‘about valerie” on my blog would do, with a bit added about my spiritual; journey if you wanted. I also said I don’t mind how or if you cut it. But if you want a new bio, how many words? Will re-send the pic… strange, it has’;t bounced back to me- I sent it two days ago..anyway, will get onto it…..
I’ll go with that. I’ll have to see if I can find the photo. Sorry for being such an airhead tonight. Also… will be looking for the new biography… I read one about twenty years ago, and thought it sounded as though her life was rather a struggle.. will Google totry to find the latest version ! Your story bought back my sweet memories of my bed reading when I was a child too… “But reading in bed isn’t just book”– Thank you, Valerie! Love the Food for Thought. Oh I just LOVE reading about other people’s reading habits, especially as you set the stage so well. So do I !!! There are so any aspects to the love of books, aren’t there! I am so glad that I save your posts to savor when I have time. I love your bedroom and the pictures on the walls and the sheets. It is the perfect reading spot. Your writing makes it all so real. I could feel the blankets and the breeze and the books. I’m a big fan of bed reading, too. And I LOVE my bed. I just posted the Rushdie quote on my Facebook page, it’s a good one. Oh Maggie, so lovely to hear from you. I hadn’t been getting your posts, and I thought you must have stopped blogging. So i’ve re-jigged my followers, and hope to start getting your witty delicious posts again.